A groundbreaking ceremony was held today to start reconstruction on the I-610 / I-69 interchange (the southwestern one). It's a $ 259 million project. 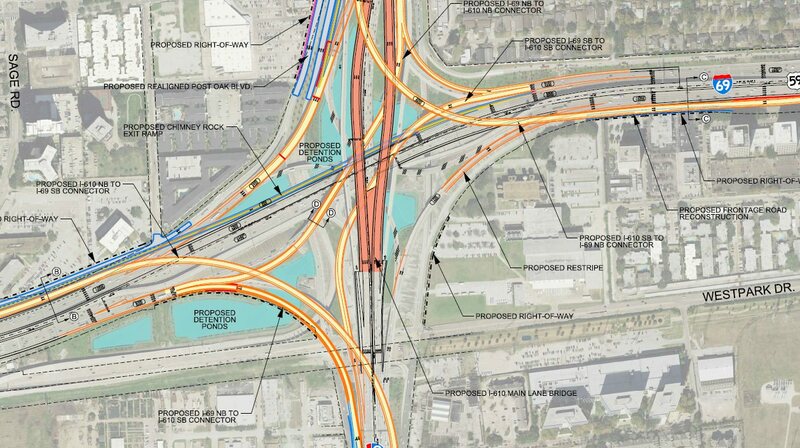 I guess the ramps over I-610 will be built first then they can close those present ramps. Interesting how I-610 NB bridge is built just to right of the right away, I guess its the only way engineers could fit the expansion in without disrupting traffic. The most interesting feature is the new ramp from southbound IH 610 to northbound IH 69, which goes over the top of the existing interchange and will be a long, high-flying ramp. How many times has this interchange been rebuilt in the last 20 years? I can think of 2 right off the bat. The interchange has not been fully rebuilt. In the early 2000s numerous enhancements were added. The Loop 610 frontage roads where brought through the interchange and the eastbound Westpark Toll road connected through the interchange. Four connection ramps were partially rebuilt at that time. Also, the two high-level entrance/exit ramps alongside Loop 610 (one on each side) were added, along with some modification to the 610 SB to 69 SB ramp. When the Southwest Freeway was expanded in the early 1990s (work completed in 1992), the Southwest Freeway main lanes were rebuilt and the HOV structure was added. Most of the interchange is still original from 1962. I'm amazed that the Loop 610 pavement on its bridge structure is just as good as the day it opened. Pavement on some of the connection ramps has needed repair. Where do the 4 overhead lanes bypassing 610 between I-10 and 59 fit into all of this? Is this project still a go? Separate project. It's one of the three projects for the West Loop (the others being the I-610/I-69 interchange, bus lanes to South Post Oak). According to a high-level TxDOT person I spoke to recently, the West Loop express lanes project is on hold for now since HGAC had some concerns about it. It is expected to move forward eventually, but not within the next 2-3 years.